The ACUSON P10 system is the ideal solution when it comes to supporting triage decisions, bedside monitoring, and traditional diagnosis, by providing additional information during the clinical assessment. With its instant power-up capabilities, exceptional image quality and a simplified user interface, the ACUSON P10 system is available immediately — anytime, anywhere you need it — helping you to make more informed, more confident decisions. 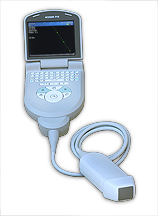 Click the button below to add the Siemens Acuson P10 Handheld Ultrasound Machine to your wish list.